Commercial griddles come in a variety of types, sizes, and models to fit the needs of just about any food service business. An essential piece of kitchen equipment for most commercial food establishments, especially for steak houses, diners, pubs, cafeterias, and coffee shops, commercial griddles are one of the most-used appliances in commercial kitchens. Anything that requires even heat for cooking burgers, bacon, steaks, omelets, pancakes, French toast and more, are best when cooked on a griddle. Regardless of your power source, space issues, or cooking needs, you’ll find a griddle on the commercial kitchen market that will easily fit your needs. Available in models that are electric, gas, or induction, designed for countertop or floor use, commercial griddles are a versatile piece of kitchen equipment that you’ll use again and again. When deciding what type of commercial griddle to purchase, you'll first want to assess what your cooking needs are. If your commercial griddle isn't your main piece of cooking equipment, or if you will cook light breakfast type foods such as eggs and pancakes, you may opt for a medium duty griddle. These have thinner griddle plates. If, on the other hand, your griddle will be your main piece of cooking equipment and will be used frequently throughout the day, you will want to choose a heavy duty griddle, with a thick griddle plate. •	Electric commercial griddles:Electric griddles are powered by electricity, and can be purchased with energy efficient features. The benefits of electric griddles are that they heat evenly, and yield results that are consistent, they are also easy to connect. The disadvantages are that they are slower to heat up and recover than a gas griddle. •	Gas commercial griddles:Gas griddles are a favorite among professional chefs. Gas griddles heat up more quickly than electric griddles and can be controlled more easily through thermostatic controls. Another advantage is that they need to be connected to either propane gas or natural gas lines, which are usually less expensive to operate. •	Induction commercial griddles: These are relatively new on the market and use induction elements to generate heat directly in and across the griddle plate so they heat up very quickly, greatly speeding up cooking times. 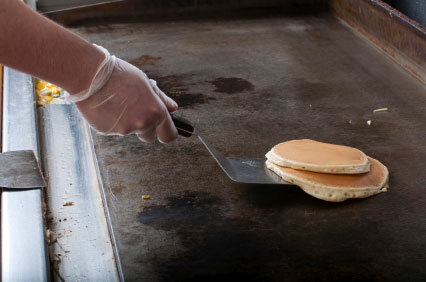 Griddles come in different sizes to fit the needs of any commercial kitchen. Determine whether you require a medium duty griddle or a heavy duty griddle, as well as the space you have available, and then decide upon the size of the griddle you will require. Also, consider the amount of food you plan on cooking and make sure that the griddle surface will be large enough to accommodate different foods at once, if needed. The most common size for griddles are 24", 36", 48", 60" and 72" widths. You will also need to consider the griddle surface you want to work with. Griddle plates come in stainless steel and chromium. While both are easy to clean and maintain, stainless steel is more resistant to scratches and dents, while chromium is highly corrosion resistant and has a shiny appearance. Another important consideration is the control options available with the commercial griddle. The choices are manual, throttling thermostat, or snap action thermostat controls. Manual controls do not offer specific temperature settings, only the more general low, medium and high ranges. This means that they are suitable for cooking meats such as burgers, steaks and bacon that don't require exact thermostatic settings. Throttling thermostatic controls allow you to set the temperature to the appropriate degrees you need and the griddle will hold this temperature until it is changed. Snap action thermostatic controls are slightly more expensive control options. These type of thermostatic controls provide accurate temperature controls which provide high quality, evenly cooked foods. As for the placement of the griddle in your commercial kitchen, you can choose either a floor commercial griddle or a countertop griddle. •	Countertop commercial griddles. Countertop griddles, while smaller and more portable than floor griddles, are a great choice for most commercial kitchens. They come in many sizes and can fit on just about any surface. They are also good for portable purposes, such as catering halls, or buffets. •	Floor commercial griddles. Floor models take up more space than other griddles and are most often used in large commercial kitchens and restaurants. A commercial griddle is one of the least expensive pieces of commercial kitchen equipment you will require for your commercial kitchen and one that will easily last for years. Choose wisely and take into account all present and future cooking needs and you can have this versatile piece of equipment for many years.